I love lazy weekend as I can get up late and there is no hurry to get anything ready or to go anywhere. Also my happy weekend means a relaxed one with yummy food! Both the boys are early risers, so I don't get much time to prepare their favorite breakfast on weekend. 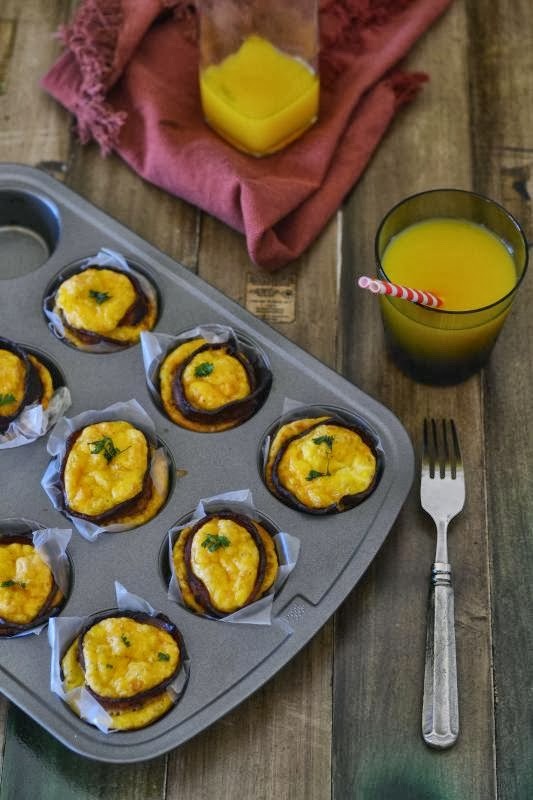 Off late I've collected several yummy breakfast recipes which are easy to make but a lovely way to start the day. 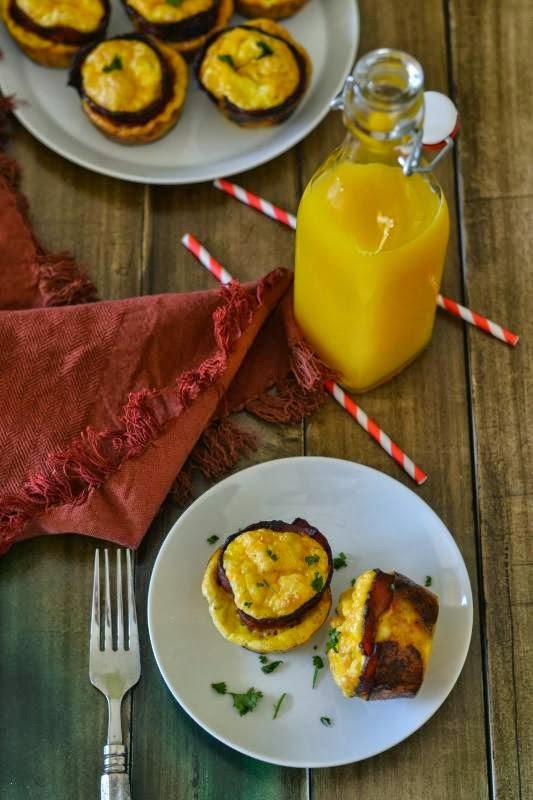 Bacon Wrapped Egg Cupcakes is one of them, favorite breakfast to my 6 years old. Couple of my friends have been asking me to post some back-to-school lunch recipes. This one is not very usual kid's lunch but will go well for a change once in a month. I do not experiment much for my kid's school lunch. As my son is picky eater, I give him whatever he likes. Usually he carries chicken sandwich, Potato / Chicken wrap, any quick fix pasta, meatballs, smashed potato, steamed or stir fry veggies. Recently I tried this Bacon wrapped Egg Cupcakes with some baked potato wedges and some vegetables. He really liked it as the lunchbox returned empty. 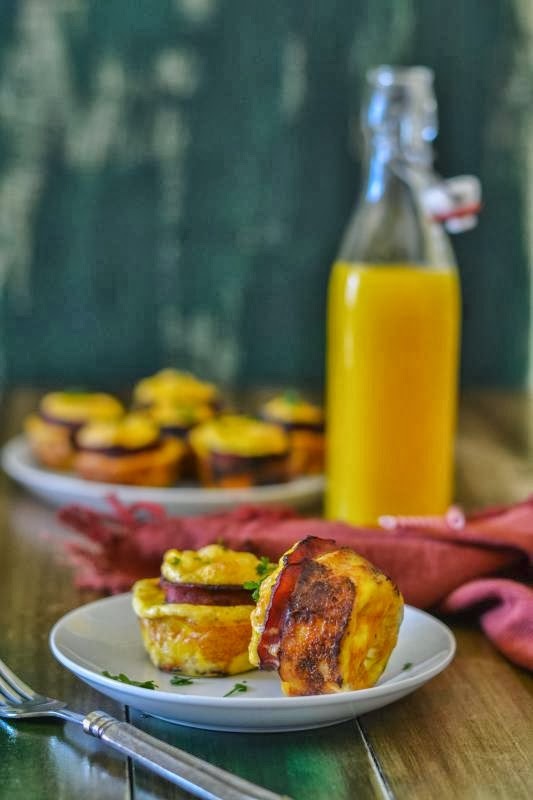 Bacon Wrapped Egg Cupcakes, is not technically a cupcake in the traditional sense, but a cute and impressive addition to any breakfast or brunch spread. It uses minimal ingredients and takes less than 30 minutes to whip together. You can add green or red peppers and onion with egg though. Most of the time I do not add any vegetables or meats with the egg, except cheese. Try it for your kids, they will surely enjoy! Chopped Vegetable : 1 cup (optional ) you can add chopped onion, green or red bell peppers, tomato, mushroom. 2. Cook the Bacon on medium heat, until it is brown but not crisp. 3. 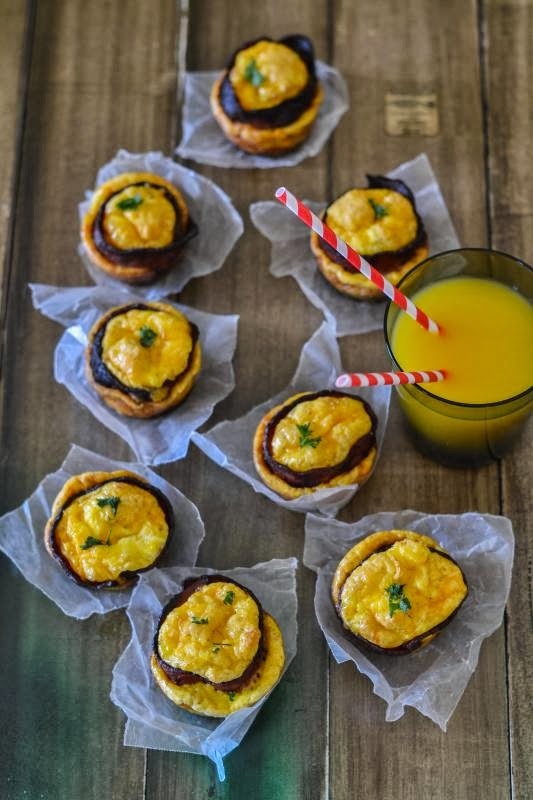 Spray muffin tin and line each cup with a bacon around the edges. 4. 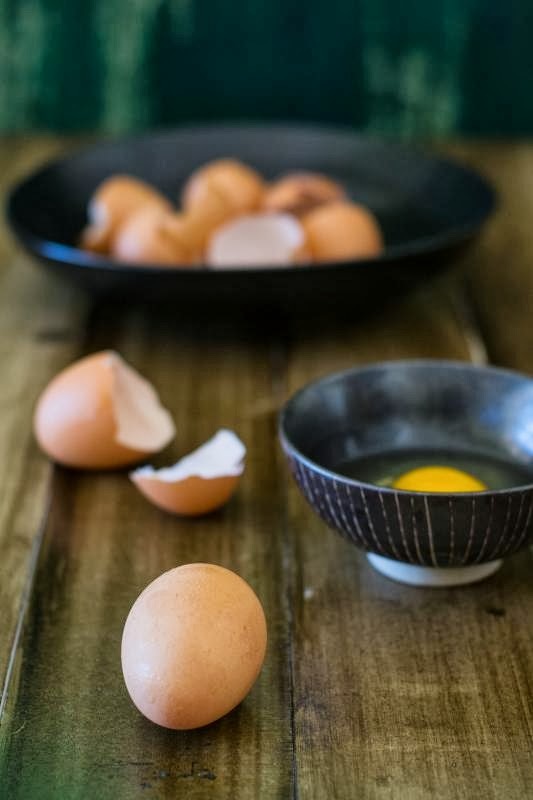 Take a big bowl and whip all eggs. Add cheese, vegetables, salt, pepper and other desired herbs to it. Mix them together. 5. Evenly pour the egg mixture into each cup. Fill it about 1/2 way. 6. Bake about 15 to 20 minutes, until egg is done. 7. Pop out and serve. Note : Wrap tightly in plastic wrap, then refrigerate up to 24 hours before serving. I am slowly realizing that blogging is not that easy and sometimes can become hectic too. Though I am enjoying this life of blogging, learning new stuffs and receiving feedback every day from readers or my other blogger friends, sometimes it’s too difficult to keep some time left for trying out and writing down new recipes. For example, I had this one in mind for few days but couldn't concentrate because of day-to-day usual stuff and weekend party, socialism and shopping. On the other hand, generally I don’t like to stay awake till late night and so my working day becomes shorter. Anyway, we have to cope up with this challenge of balancing between our interest and other day-to-day boring stuff. Last week, on Friday night our dinner menu was Cholar Dal with Luchi. Cholar Daal, whose English name is Split Bengal Gram, is a very popular Bengali dish, especially when it is prepared with coconut. This one is much different from the Daal (lentil soup) we cook every single day. 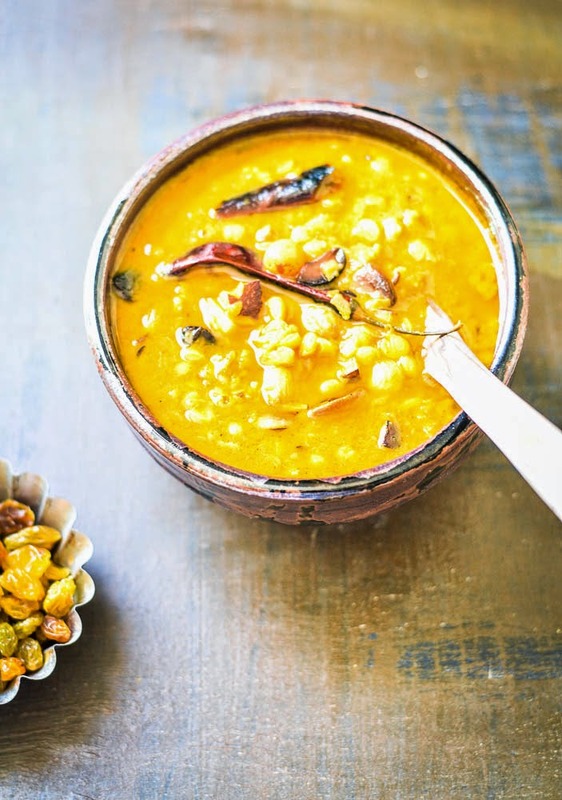 The regular daal is simpler, flavored and tempered with some spices, which Bengalis generally have with rice. 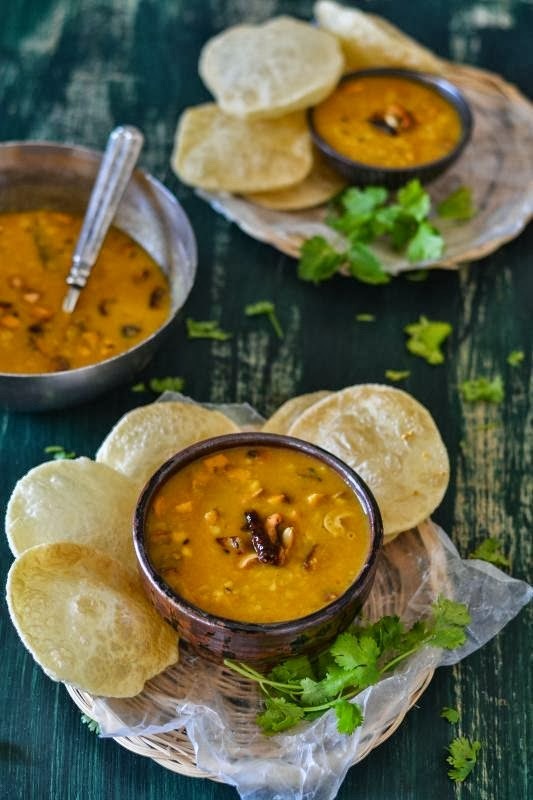 But Cholar daal is mostly cooked on special occasions, usually served with Luchi (Indian Puff Bread) or sometimes with Pulao. 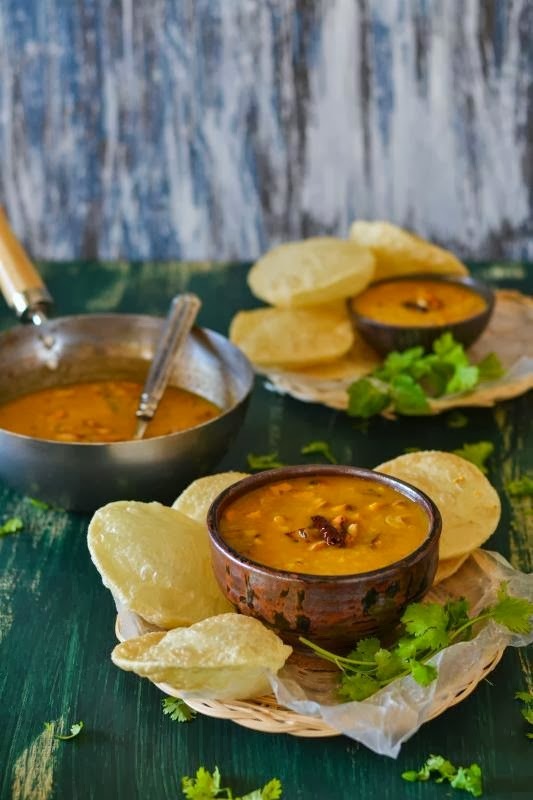 The humble combination of Cholar daal and Luchi makes any occasion special and you would find many Bengali who would start licking their lips after hearing this phrase. The recipe is not complicated and flavored with minimum spices. 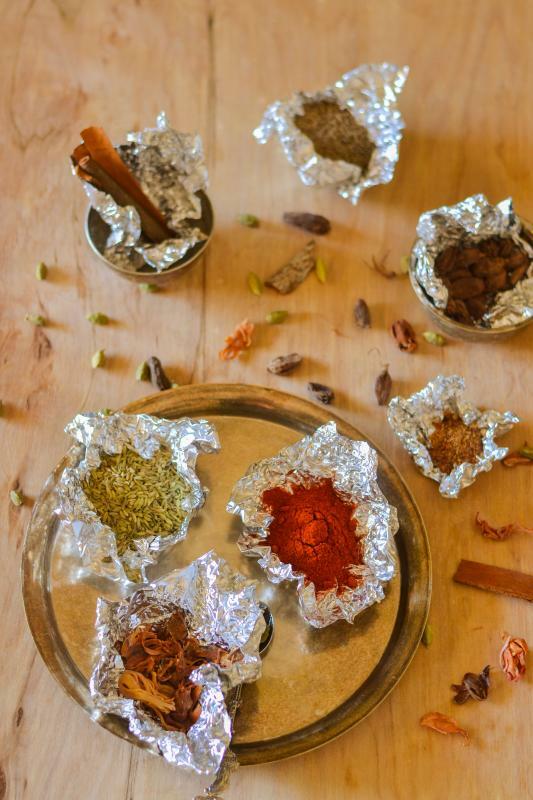 The addition of coconut, other spices like chilies and the seasoning is simply delectable to the palate. Though it is a not sweet dish, still the original dish tastes little sweet. Please note that Cholar daal (Split Bengal Gram) that is also known as Channa dal and Channa Dal and Toor daal (Split Pigeon Peas) both look very similar, but taste-wise they are completely different. Sometimes people get confused between these two. 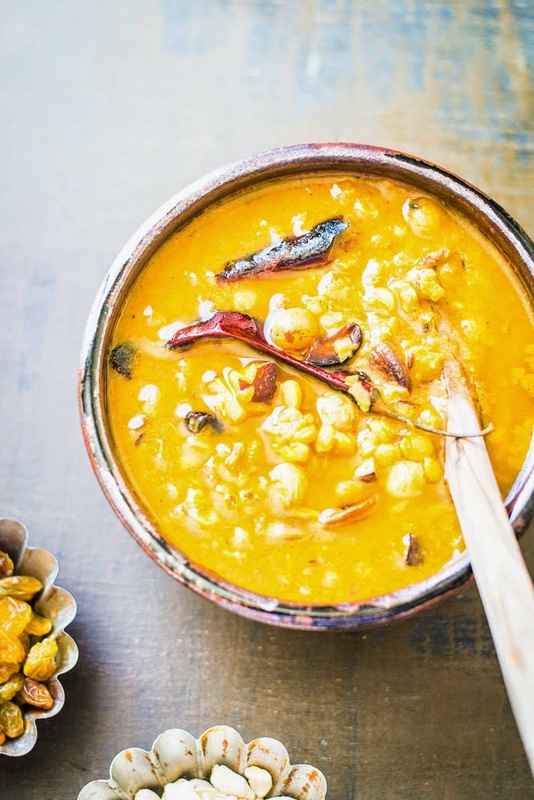 Many recipes are there in Bengali cuisine with Cholar Dal and all are delicious. Will try to share some of them later. 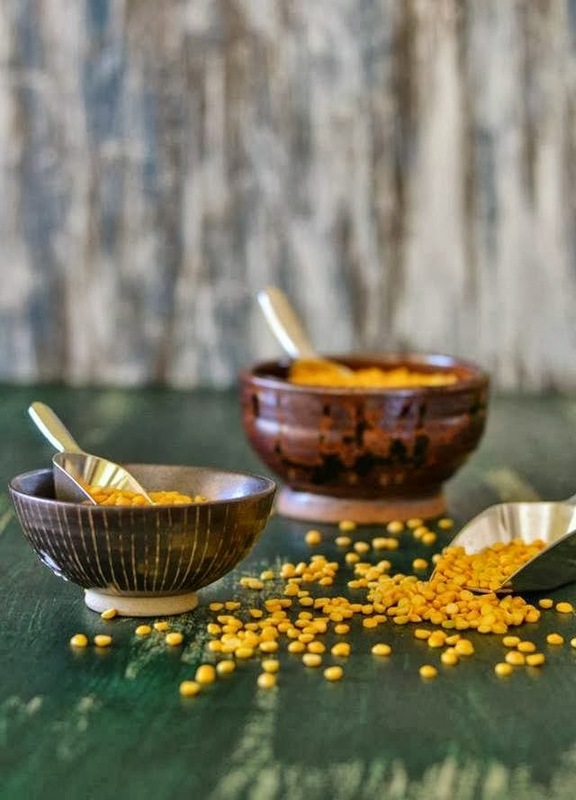 Try this recipe of channa dal for a change, hope your family will simply love it. 2. Boil the Dal, there are two methods, one is pressure cooker method. Another one is sauce pan method. 3. 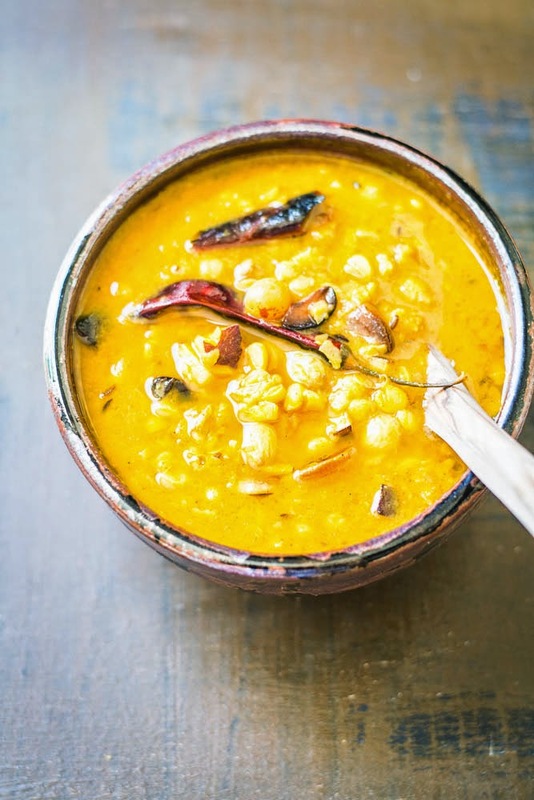 For pressure cooker, rinse dal and put it in the cooker along with enough water, salt and the turmeric powder. The water level should be half of the finger ( 1 cm approximately ) tall above the dal. Cover the lid and let it cook in medium heat until you hear three whistles. Remove from heat, first let it cool down completely, then open the lid. 4. Another process of boiling dal, take a deep sauce pan, rinse dal and put it in the pan with enough water, salt and turmeric. Bring it to boil and then let it simmer until the dal is well cooked. Add more water in the boiling process, if needed. 5. Once dal becomes soft and well cooked, set it aside. 6. Take a deep pan or wok, heat 2 to 3 tbsp oil. Add asafoetidia, whole cumin seeds,dry whole red chili, bay leaves. 7. Once they become aromatic and start to splatter, add the coconut. Fry it until they change color to nice golden brown. 8. Add the the cashew nuts, stir it for 2 minutes, add the raisins. Add ginger paste, cumin powder, red chili powder and 2 tablespoon water. Give some stirs, until oil starts to come up from the sides of pan. 9. Now drop the cooked dal to the pan and stir it nicely. Let it cook for couple of minutes. Add water if needed ( as per your desired consistency ). Add sugar, check the seasoning, add salt if required. 10. 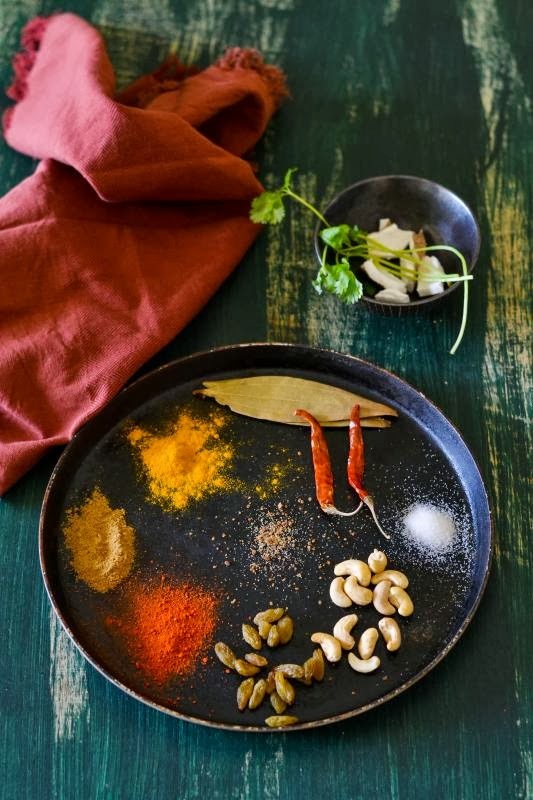 Once done, pour it in the serving bowl, garnish with some fried coconut flakes and roasted cashew nuts. Serve hot with bread or rice. Here is best time of the year slowly approaching - the festive season. We Bongs already started counting the days before Durgapuja. As soon as those grand four days are over, we start waiting for Diwali, the most celebrated festival in India. Then the east meets the west. Nowadays Thanks-giving has become so special to us, especially for that longer weekend and mega shopping deals. The festive season ends with Christmas trees, lights, cakes and probably with a short trip to your hometown. Last week too, we celebrated couple of pujas, Janmastami (birthday of Lord Krishna) and Ganesha chaturthi. Sometimes on these auspicious days, we avoid non-veg food. So I tried couple of good vegetarian dishes. Today I will share one of them - Phulkopi r rezala or Cauliflower Rezala. 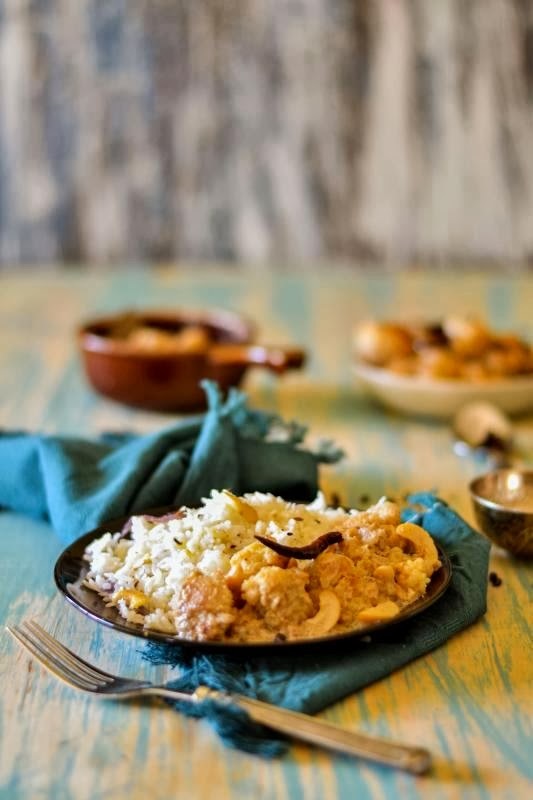 Pulkopi is the Bengali name for cauliflower and Rezala is a yogurt-based dish with very flavorful, delectable and light gravy. The dish is simply awesome and definitely worth trying. You can have it either with bread or steamed rice. Rezala, introduced in Bengali cuisine by the Nawabs, when they ruled Bengal and its popularity expanded slowly among people. During this Islamic rule, the Influence on the food was top-down, where the common started trying the dishes of the royal court, such as biryani, korma or Rezala. Rezala was mainly used to cook with mutton or chicken. 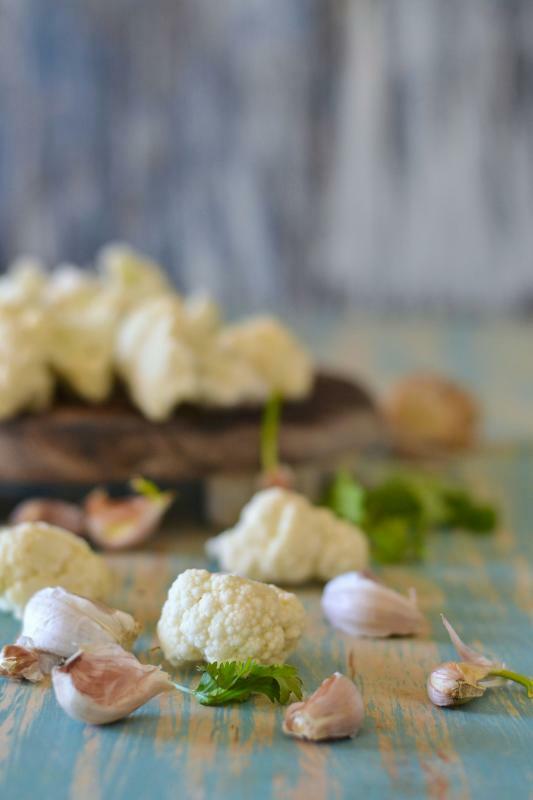 Probably in the modern days, chefs have experimented with vegetable dishes like Cauliflower or Paneer. But the outcome is equally good, no less than any non-vegetarian dishes. Interestingly Rezala has confined itself within Bengal. You won’t find it in rest of the India. So whenever you go to Kolkata, must visit one of those legendary food joints who serve rezala to get its magical aroma. I have read couple of recipes, but many thanks to my friend Tanaya. I liked her idea of adding charmagaz (melon seeds) paste to the gravy. Here is the recipe, which is very simple and easy to cook. Garam masala / spice mixture : Take two green cardamoms and a half inch cinnamon stick grind it to a coarse powder. 1. Add poppy seeds, melon seeds ( charmagaz ), a green chili and half cup of water in a blender and make a paste. 2. Take a wok or a deep pan, add 3 tbsp of oil and heat it up. Once oil is ready, add the cauliflower florets to the pan. Fry it till they are light brown. 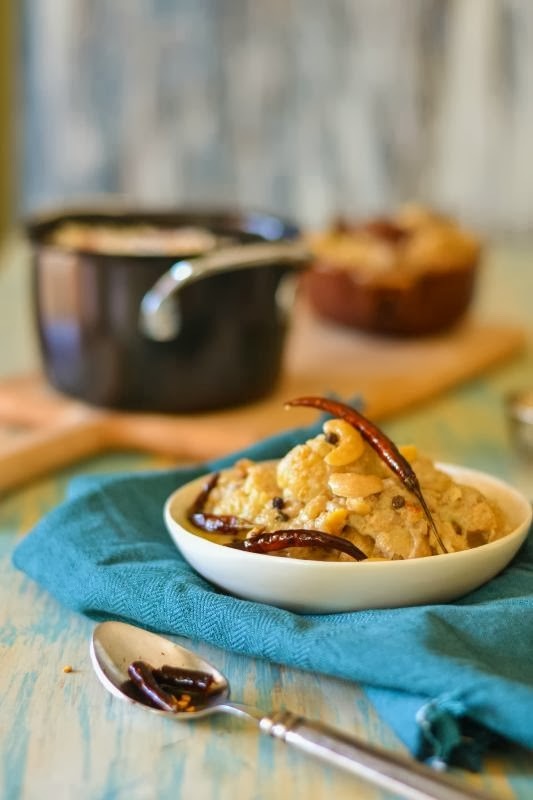 Once cauliflower is almost done add the cashew nuts and give some stirs. 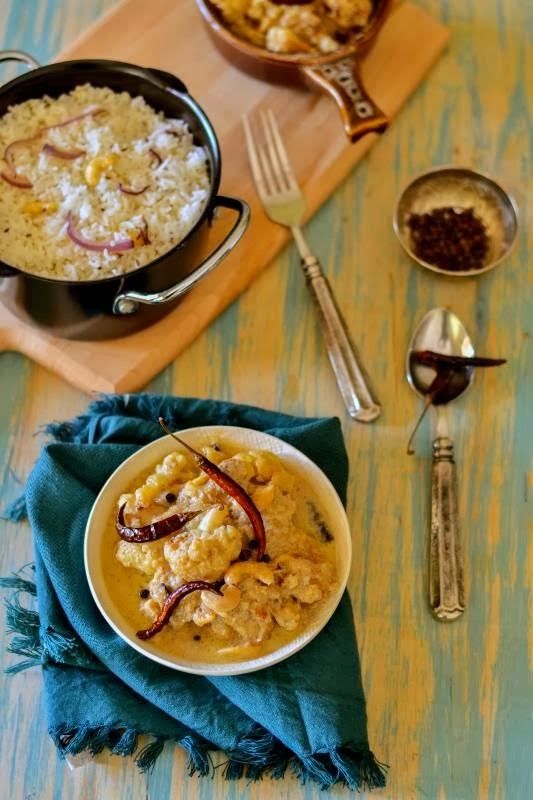 Take both cauliflower and cashew nuts out of the pan and set it aside. 3. Add 1 or 2 tbsp of oil to the same pan, add dry whole red chilies, add bay leaves, pepper corns, green cardamoms, cinnamon and cloves. 4. Once they are fragrant, add the chopped onion, stir it until it becomes light pink. Add ginger and garlic paste, mix it well and cook it until raw smell goes off. 5. Add the poppy seeds - watermelon seeds - green chili paste to the pan, stir everything and mix well, till oil starts coming up from the sides of the pan. 6. Take a bowl, add the yogurt and all purpose flour to it. Whisk the yogurt nicely. 7. Add the yogurt mixture to the pan, add salt and sugar. Stir it and cook the gravy until all are well mixed and oil comes up from the spice mixture. 8. Add cauliflower and cashew nuts to the pan, again give some good stirs. 9. Add half a cup to 1 cup water to the pan and add salt. Put the lid on and let it cook over medium flame. Once cauliflower is well cooked, check the seasoning and desired consistency. Add sugar or salt if needed. 10. Add the garam masala ( spice mixture ) and a tbsp of clarified butter ( optional ). 11. 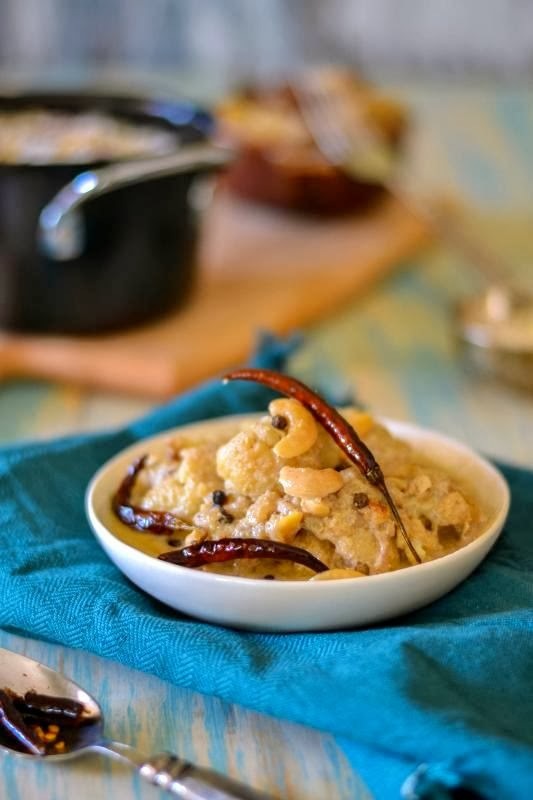 Cauliflower Rezala is ready to serve, goes well with any kind of bread or rice. Note : You may try this recipe with Paneer (Indian Cottage Cheese ) too. 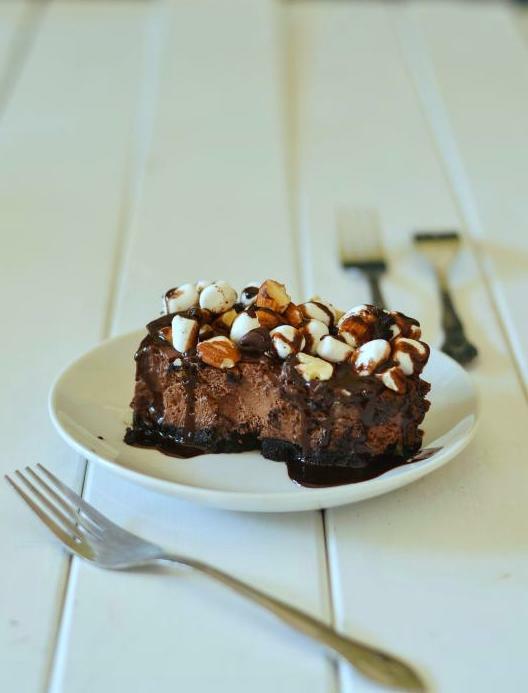 If you are looking for a cheesecake that is bit different from the rest, then here it is. 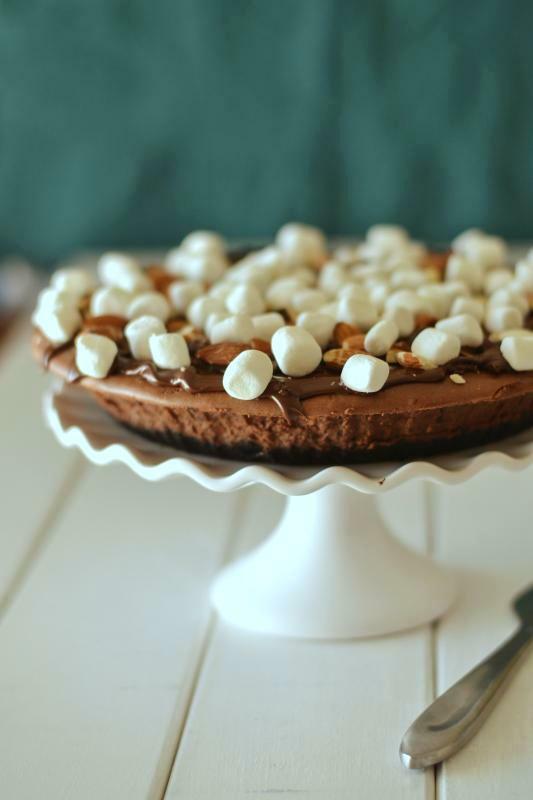 Rocky Road Cheesecake is a chocolate cheesecake with an Oreo crust, topped with marshmallows, nuts and milk chocolate. 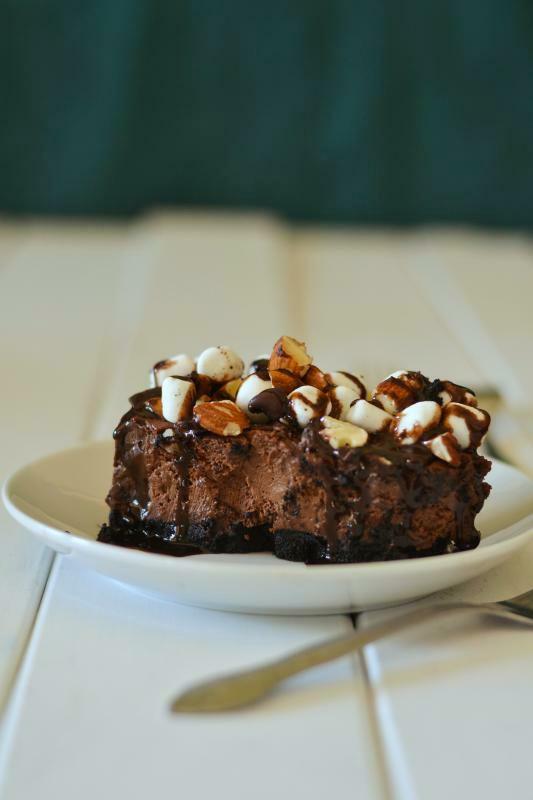 Rocky Road is a type of dessert, usually served in individual portions as a cupcake / cake or with an ice cream flavor. 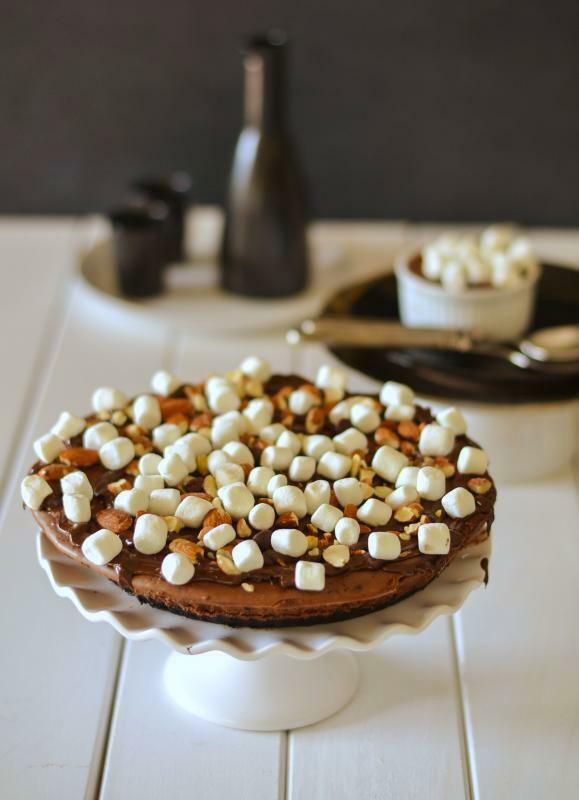 It is made up of milk chocolate, marshmallow and nuts like almonds or walnuts. This is my second cheesecake. Was it worth the time and effort? Certainly! 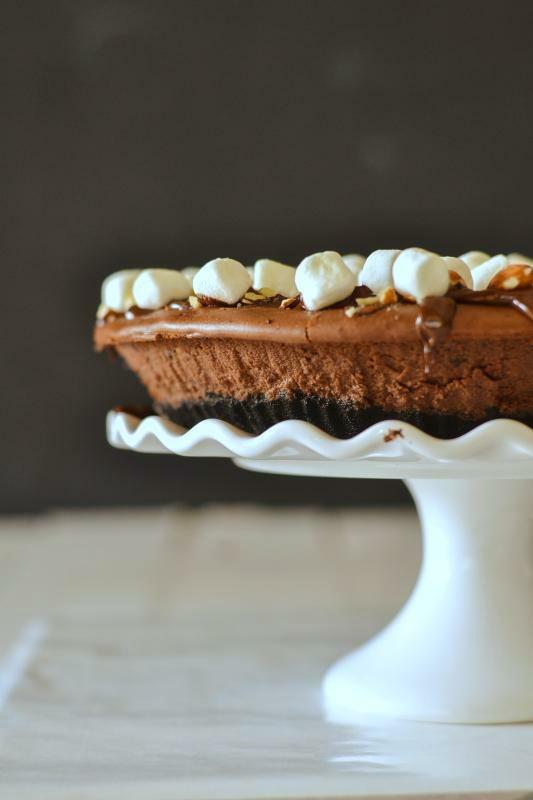 It’s not only gorgeous in look; Rocky Road Cheesecake is so creamy and rich that you would love each and every bite! This is one of the best cakes I've ever made. So if you want to impress your someone, go for it. Cream cheese (softened ) : 16 oz. Dark chocolate : 10 oz. Semi-sweet chocolate : 4 oz. Chocolate (melted) : 4 oz. 1. Preheat the oven to 350 degrees F or 177 degrees C and grease the pan. 2. Put the Oreo cookies in a food processor, and crush it to a fine powder. Add butter to it and mix nicely. 3. Press the Oreo mixture into the bottom of the pan. Put the pan in the oven and bake it at 350 degrees F for 8 minutes. 4. Remove from the oven and let it cool down. Turn down oven temperature to 275 degrees F.
5. Place both the chocolate in a heat-proof bowl over simmering water. Stir continuously until chocolate is melted and set it aside. 6. In a standing mixer with a paddle attachment, beat the cream cheese and sugar on medium speed. ( you can use hand mixture too ) Add sour cream and beat to combine. 7. Add eggs, one at a time and mix it. Pour in melted chocolate and mix it for another 2 to 3 minutes until well combined. 8. Pour the cheesecake mixture over Oreo crust and bake for 45 minutes, or until the edge of the cheesecake is puffed and center is still wet-looking or wobbly. 9. Turn off the oven with the door slightly opened. Let the cheesecake sit in the oven for 1 hr to cool down completely. Then put it into the refrigerator for at least 3 to 4 hours. 10. 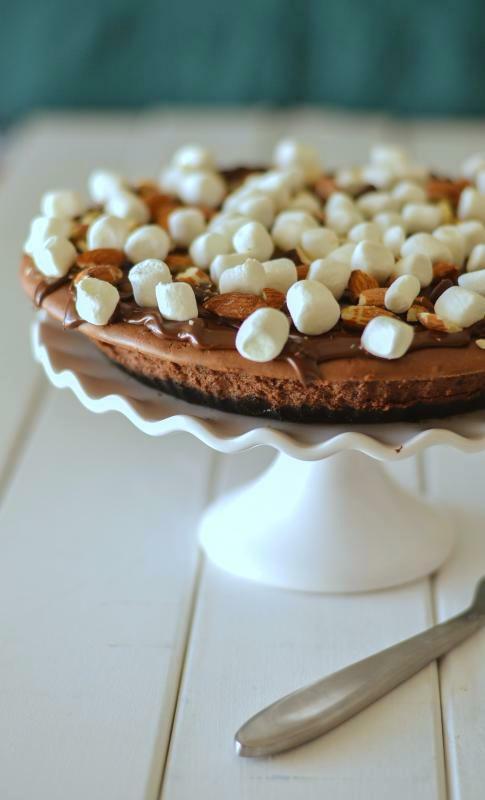 For Topping : Pour melted chocolate on top, then sprinkle salted and roasted chopped almonds and marshmallows on the top of the chocolate. Then drizzle over some extra chocolate. Hi there! I'm back to kitchen after an awesome trip from beautiful Yellowstone, though I am still absorbing the beauty of WY! Clicked many good moments and will post some of the photos in my next post. 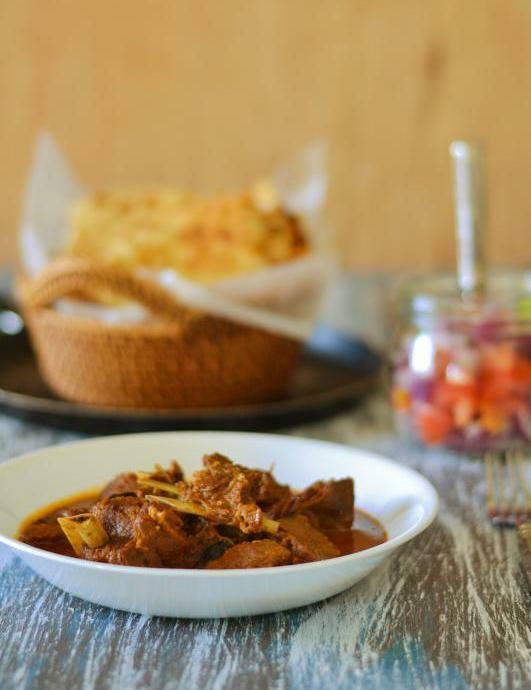 Today I will share the simplest recipe of Goat Curry, which you can try with lamb too. I am sure that my Bengali friends would certainly enjoy this; most of them think that mutton is the only real meat or “mangsho” and other variants like chicken is baby food before the same. Rogan Josh is a fine delicacy from northern part of India. 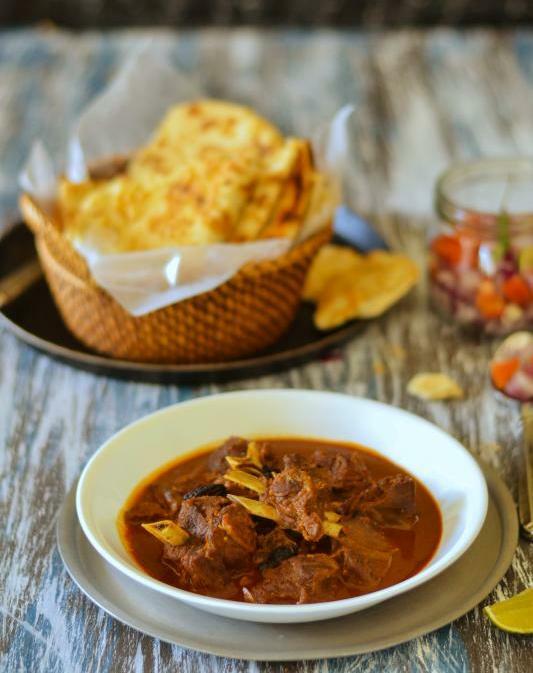 It’s a rich, spicy and aromatic meat dish that is believed to be originated from Persia and very popular both in India and other parts of subcontinent. Rogan means clarified butter, Josh means hot and passionate. It’s a signature dish with a red color that is resulted of using mild red Kashmiri chilies. 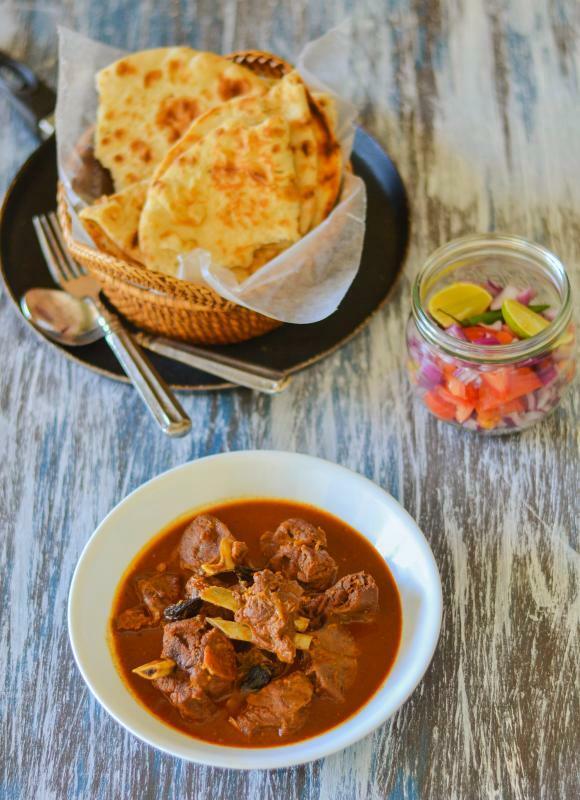 The curry is prepared with lamb or goat shoulder which is tenderly cooked. It will have juicy texture in a gorgeously rich sauce. Traditionally the dish is prepared with ghee. 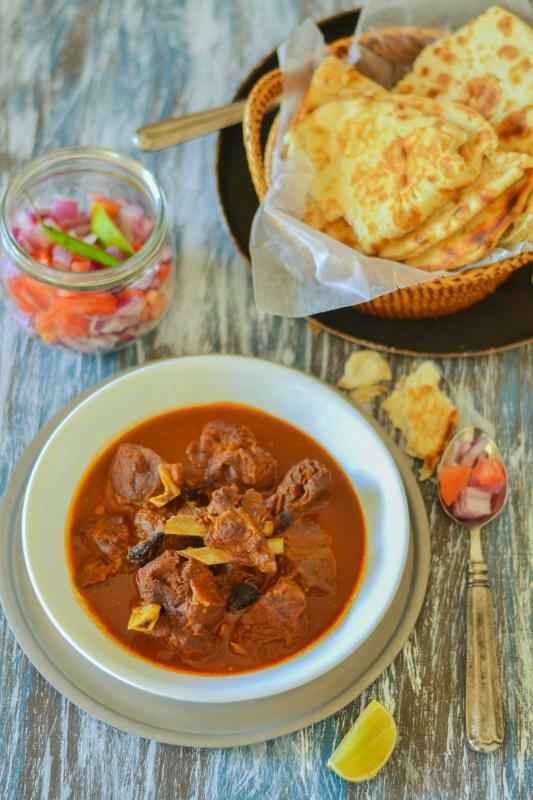 Rogan Josh is served with any Indian flat bread. Paratha and Naan are perfect choices for mopping up the delicious gravy. There are several versions of this dish. As I was looking for some quick preparation, I followed the Kashmiri Pandit style. It means no onion and no garlic. You won’t believe that a non-veg dish could be so tasty without onion and garlic. If you are a regular reader of my blog, you probably have noticed that at home, we prefer white meat compared to red. In last few months, I posted only couple of goat recipes like kosha mangsho or braised goat ( click here for recipe ) and minced goat cooked with dried yellow peas (click here for recipe). But this particular mutton dish was favorite of both me and my husband, when we used to visit a restaurant called “Raaga” in Bangalore. To remember those golden days when we were newly married, I just gave it a try and nevertheless it came out delicious. 1. Wash the mutton pieces and pat dry. 2. Take a bowl, add hing, Kashmir red chilly powder, ginger paste, add saffron and water. Mix it well and make a paste. 3. In a blender, add cumin seeds, fennel seeds, green cardamom, cinnamon stick and mace. Grind it to a coarse powder. 4. Take a pan, add ghee to it and heat it up. Add black cardamom and goat piece to it. Cook it in a slow flame till meat pieces turn to brown in color. 5. Add spice mixture paste to the pan, add salt and mix it well. 6. Take a bowl, add the yogurt and add a pinch of flour to it. Mix it well and set it aside. 7. Once spices are well cooked, add the beaten yogurt and the spice powder.Give some stirs and mix well together. 8. Add enough warm water and add salt. Put the lid on and cook it over low flame. Stir occasionally to prevent burning at bottom. 9. Once goat pieces are well cooked, and oil comes up from the sides of pan, check seasoning, check the consistency and turn off the gas. Mutton Rogan Josh is ready! Serve hot with Indian flat bread like Naan / Parantha or steamed rice.